In just over two weeks it will be a year to the day that I decided it was time to buy my dream car: a Delorean. 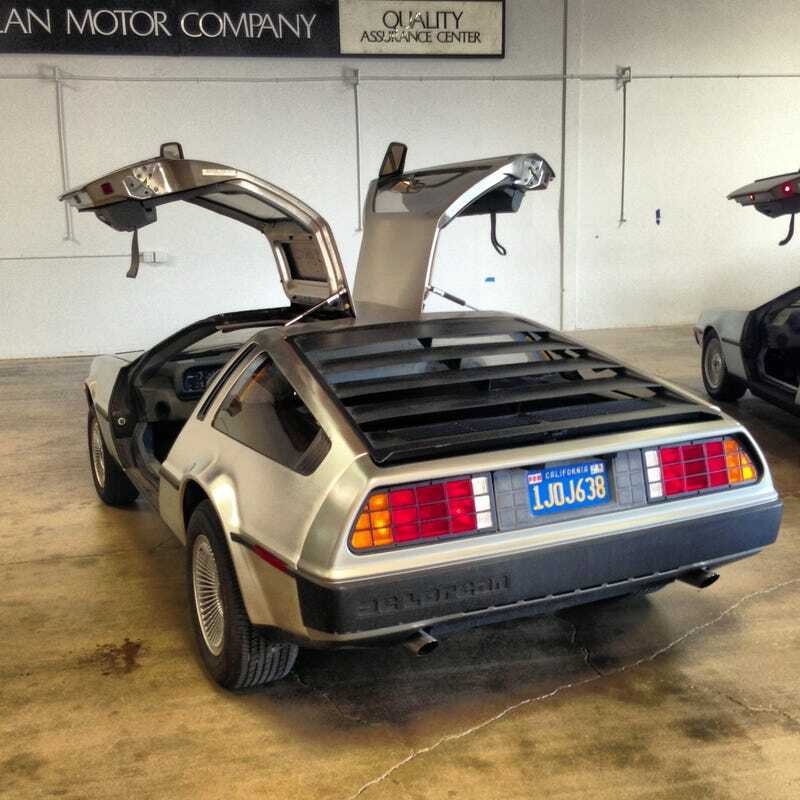 I enlisted the help of Texas's Delorean Motor Company to get the search going for the perfect car. Eight months of searching and three months of restoration, and two days ago, I went down to DMC's new Huntington Beach Location to pick up the paperwork to register the car and hear its new engine run. Let's take a step back and think about the car: It's a 1982 build car, but re-vinned as a 1983 model during the "fucked up corporate" year of the company. It was purchased by a man named Anthony in San Pedro, CA, driven 2,118 miles, and stuffed in a storage unit, where it sat, unmoved, until earlier this year. When we got it, it was dirty and all the fluids had gone bad, but the original tires still held air, the body work was immaculate, the interior was in great shape, and the blue California license plate still wore its 1984-85 registration sticker. And, make no mistake here, if you're thinking about buying or upgrading a Delorean, this is the only place you should even be considering. With Stage II upgrade, you get new heads, cams, intake manifold, intake, long-tube headers, and exhaust, and with my restoration comes a new fuel system, ignition system, Eur0-spec suspension, all new brakes, all new electronics, new (old) radio, new speakers, new headliner, and tires. ... and it sounds amazing! Everyone can talk crap about the PRV engine all they want, and yes, it was choked by early 80's emissions crap like every other engine out there, but it's hard to argue with Delorean's Stage II upgrade. Basically, what I'm going for here is a Delorean that's better than new. A one-owner example that's restored not only to concours condition cosmetically, but to drive as John Delorean always intended. Not with some crazy motor swap that will drag on for years and never run right, not with some frankenstein turbo, just a better Delorean. Here's an (admittedly, ghetto) video of me seeing the new engine, hearing the car run for the first time, and I couldn't be happier with it.